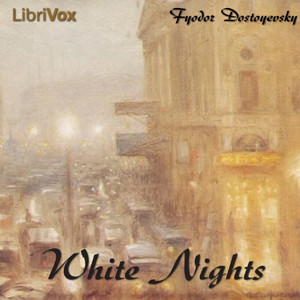 Belye Nochi ”White Nights” by Fyodor Dostoyevsky. In this small 100kb story (though author states this is a sentimental novel) author describes in his traditional and particular way the internal world of one young lonely person. Once, hero is going out to have a little daily promenade alone and he occasionaly meets an attractive and lovely woman on evening streets of Saint Petersburg. Can he fell in love with her? Can they estimate the value of this relationship? Can they lead a happy life in this city of lonely hearts? You will know the answers on all these questions if you read or listen to a story.